The captain's chair from the credits looks similar to the TOS version, except for an odd handrail/support behind the back. I think it's inevitable. I have a suspicion that they might get into a pattern of one-season-only appearances by various TOS characters. I bet Kirk shows up, but after Spock has left the show. Just a gut. Spock already has three murders to his credit, so Kirk is really going to have to up his game! SpocksOddSocks and Tim Thomason like this. So that means if the Talosians show up on Disco, Michael and company will have to venture to Talos on the Enterprise. So maybe we will see the interior of the Big E, including the bridge, after all. It's been widely reported that the Enterprise bridge will be seen. Also, we've seen some of the interiors already (corridor and Spock's quarters). I think he would've gotten it about 10 years before this. Also, we've seen some of the interiors already (corridor and Spock's quarters). Well those are redressed Discovery/Shenzhou sets. Spock was one of the two officers that recommended no further contact with Talos IV. He signed off along with Pike on the report to Starfleet. It's really weird how they expressly pointed out that Spock was HALF-VULCAN. It really weird how they expressly pointed out that Spock was HALF-VULCAN. The admirals of the United Earth Space Probe Agency are well known racists. King Daniel Beyond and Paul Weaver like this. The admirals of the Earth Space Probe Agency are well known racists. Must be, cause they did it TWICE in that report. Perhaps Spock even signed his name that way? True. But, given how much Finnegan tortured poor Kirk I'm thinking he will have to wait until later in his career to start catching up to Spock. That just means it's serious business. But not as serious as a full Vulcan signing off on it. This just demonstrates the human bias at the time. 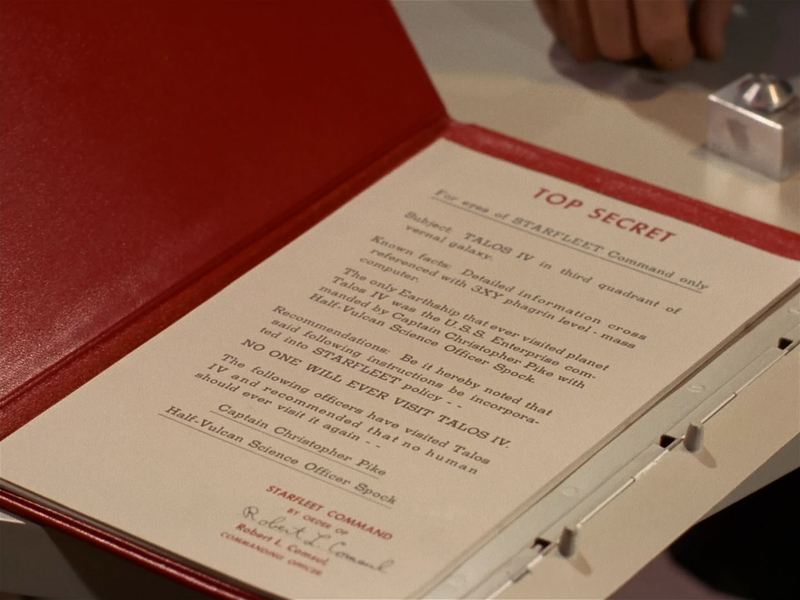 If Spock were at the Vulcan Science Academy he would have to sign as "half human." Campe98, Nerys Myk and Henoch like this. Starfleet was still solely under United Earth which is a human based organization up to the mid-first season of TOS, when it was transferred to the Federation (when did TOS take place, 23rd century or 22nd century). Aliens (and half-aliens) are rare, or should be rare, serving with humans in the CAGE, DSC and still rare in TOS. Long-term environmental (and language) concerns probably limit most alien postings to earth based starfleet and ships. Even Spock, who is half-human, finds the Enterprise uncomfortably cold as he finally confesses to McCoy in "The Deadly Years". Vulcans will find it too high in O2 or high pressure, and too cold (per "Amok Time"). Andorians will find it too hot (ENT retcon). Tellarites too...clean smelling or too high gravity judging by how weak and unstable the ambassador looked in "Journey to Babel". Short-term, you can tolerate it, but long-term can be, if not uncomfortable, hazardous to your health. Assuming that DISC gets a third season, should the Discovery crew run into a young James Kirk? Why or why not? And at what point? Dear God, I hope not. Having Pike and Spock on for Season 2 is bad enough. Perhaps I can tolerate a one episode appearance and nothing else. Avro Arrow, Nerys Myk, SpocksOddSocks and 1 other person like this. But it didn't include ... HUMAN Captain Christopher Pike. Campe98 and King Daniel Beyond like this.